The clock of St. Peter's Church in Zürich is the largest church clock face in Europe. Would you believe that it is even bigger than Big Ben's? It came as a surprise to me to find out that MIGROS, my favorite grocery chain in Switzerland, actually has an international twin. In fact, MIGROS is the biggest grocery chain in Turkey, with a legacy dating back to 1954! Sweden's Ingvar Kamprad, the founder of furniture chain Ikea, remains Switzerland richest resident for the tenth year, according to an annual ranking by business magazine Bilanz. His assets, including the chain of Ikea stores, are valued at 35'000'000'000 Francs. Every December, the Zurich Statistics Office is keeping residents amused and entertained by revealing fresh nuggets of information. Hence, an egg from a foreign farm cost 32 Rappen (cents) and was, therefore, the least expensive item for sale! If you are visiting Switzerland for the first time, you will undoubtedly notice the many fountains with crystal clear drinking water! 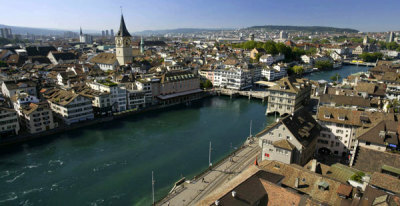 As it turns out, with no less than 1224 fountains, Zürich is one of the world's most fountain-friendly cities! Just as the US has iconic mailboxes, almost every home in Switzerland has the same type of mailbox. The top slot for letters is usually locked, and the bottom section has a door for packages. Unlike the US, letters to be mailed cannot be left in the mailbox for pick-up! Freddie Mercury and Queen loved Switzerland and ended up buying a recording studio outside Montreux on Lake Geneva. There is a statue to Freddie on the shore, featured on the cover of their album "Made in Heaven". 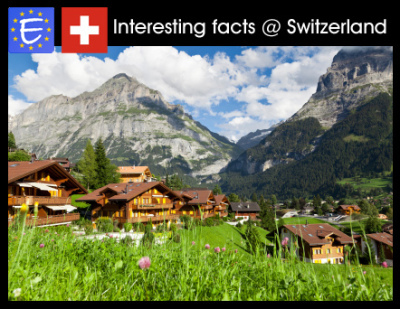 The Facebook "Like" button has a whole other meaning in Switzerland, where it also signifies the number "1"... By the way, the number "1" is often written as a "7" in the US (a "7" is written with a horizontal cross)! On the other hand, Kebab stands are abundant and affordable. To use a shopping cart at the grocery store, you have to deposit a 1 or 2 Franc coin in a slot on top of the cart. This will release the chain by which the cart is attached to the next one. When you return the cart to its place, you will get your deposit back - without interest, though. Latin is not spoken, but appears on the stamps and coins as "Confederation Helvetica" or "Helvetica". 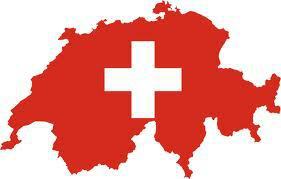 This is the Latin name of Switzerland. The spoken languages are German, French, Italian, Romansh. Now you know why the international abbreviation for Switzerland is "CH"! That's a fact! 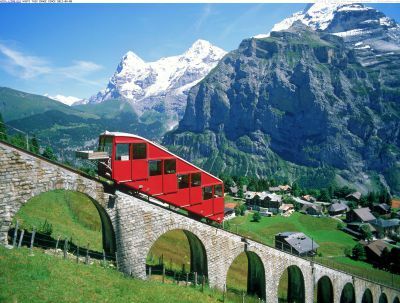 If you don't believe it, check out this listing to find out about the more than 40 shipwrecks in Lac Leman (Lake Geneva), including four railway cars from the mid to late 1800's!